Have you found an online vendor selling Bayou Silver? This is an agricole (sugarcane) tasting rum, but it's a little sweeter than most agricoles. Tastes a little like sugar syrup (which I like in this). Smooth and easy drinking, this is a nice light rum. I'm not a big fan of light rums, but this is above average to me. Strong enough but sweet enough at the same time. I have been very reluctant to try any more rums from Bayou after being disappointed with their Satsuma and Spiced. So when I picked up their Select today, I added this one to the basket as well. I really had my doubts before opening it, so I read the back of the label. Unlike the Select that is 100% agricole from cane juice, this one is a mixture of cane juice and molasses. It is fermented with cane yeast and distilled in copper pots. My first sip really surprised me to the point whereby I told myself, "Damn, that tastes awfully familiar". After a few more sips, the vanilla and chocolate notes remind me very much of Vizcaya Cristal from the Dominican Republic, one of my top rated white rums. This was indeed a pleasant surprise! Had a rum tasting on a sunny afternoon, because why not. Bayou Silver Rum bottle and label design looks nice and unique. Strong alcohol and a plethora of artificial flavors to the nose and palate. Strong burn at the end. Barely mixable. I would skip this one for sure. If you're looking for another Bacardi style silver, this isn't it. It's more like an agricole, made from sugar cane instead of molasses. Very clean on the nose, and a good flavor to follow up. Not a bad clear mixer rum, would buy again for a daily mixer. I've only had a sip so far, but it tasted smooth and I like the aroma. My bases for comparison are two national brands distilled in the Caribbean. I doubt that the origin of tha Bayou Silver, which I bought because I'm a Louisiana expatriate and love new La products, that caused my dislike. Maybe I got a bum bottle or something, but there's a weird chemical taste to this that reminds me of a certain bottom-shelf vodka that smells and tastes like acetone. Bayou's smell/taste isn't acetone, but it is bad enough that I doubt i will ever but another bottle or recommend it. Something is getting into the production chain somewhere - hunt it down and kill it. What can I say, Louisiana sugar cane. Sweet, smooth, and delicious. It makes a perfect daiquiri. I'll start off this review with a short history of how I got this bottle. I live in the liquor nazi state of Pennsylvania where the LCB has their greedy, grubby hands in everything. Want to order a bottle over the internet? You have to ship it to one of their state run stores and pay them a $4/bottle fee on top of your original purchase/shipping cost. However, there is thousands of spirits available through what they call an "SLO" special liquor order. 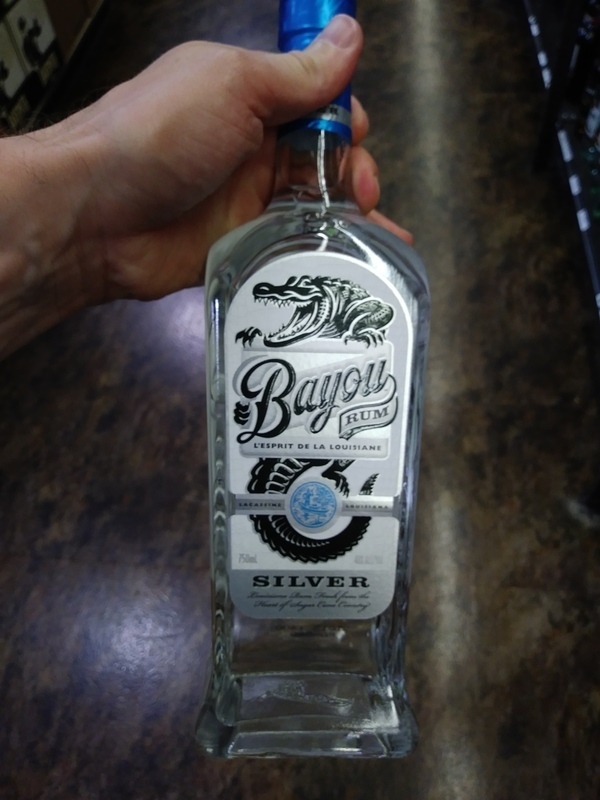 The Bayou Silver was an SLO and was told that its a very popular one at that, so I was excepting the bottle to arrive quickly. NOPE. It took almost 3 weeks to get the bottle. It actually took 15 days to get to the liquor store and an additional week before I called the store and they said it's been sitting there. No phone call from them! They were almost ready to send the bottle back. When I picked the bottle up, it was in a large box with a copy of my invoice attached to the top with my contact info on it. Still, no phone call. "SLO" or SLOW rather. This is my favorite.... I love mixing with Coke Zero. Sweet, not bitter, tastes fantastic. I'm proud it's made here in Louisiana! Geaux get some. Another rum I came across during Tales of The Cocktail. Disappointed after the hype of "Americas rum" and price point. What you have is a sugary, syrupy rum that just falls flat. Not sure what I expected but this is very good Silver rum. Sweet and clears nicely its a great mixer not as heavy as say a Banks but just as rewarding. The best rum I've ever tasted. World class. No medicinal or chemical aftertaste. Like drinking the pure essence of rum with butter and vanilla mellowness. Drink this neat! It's that good. This tastes exactly like I've thought rum should taste, but never has until now. The best rum in the entire world at any price. Going to bring more of this back next trip! It's a 10 "I guarontee!!" It is interesting how subtle the fragrance is upon opening the bottle. Almost as if it were a mixed drink. I was expecting something stronger in terms of odor but the Bayou Silver rum's odor is mild yet has the cane element one expects in rum. Its flavor is not harsh but just slightly sweet. Not really complex but quite tasty. This would be equally good straight, on the rocks, in cola, and in mixed drinks. A very versatile rum. Definitely recommended among white/silver rums. A fine flavor for a silver rum, great in mixed drinks or cola. Splash of lime. This is one of the few silver rums that I could drink neat. I was not expecting much being a silver rum. But this is much more better than the Old New Orleans Silver rum. Ok im not really a big fan of this white rum..There is better out there.I like the spiced version better. Such a simple rum, it fades from consciousness after trying their Spiced variety. Well rounded and excellent for mixing. Like the dark and the spiced ones, it´s a great budget rum and this one makes a good daiquiri. A mixing rum. From my home state. Distillery new and will get better.